At the time it was hard for me to believe that a year had elapsed since I was at Queens Park during Word on the Street. It felt like I was just here, peddling the "VHS RIP" issue. After an extra long winter and a too-short summer, the fall roared into action, and as usual I was barely prepared to launch the new issue, despite the fact that all summer I was moving at a fine clip gathering research for ESR's latest incarnation, the tribute to late-night television, and before I knew it, what with a huge work schedule and feeling of lethargy after hours, I had once again broken a promise to myself not to indulge in this "night before" crunch that always happens. 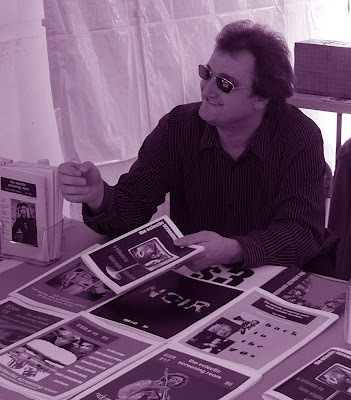 Saturday afternoon, it was bloody obvious that the new issue wasn't going to exist for the next day, which would be ESR's fifth appearance at Word on the Street. After an anxiety attack (no doubt brought on by overtired-ness), I had succumbed to the realization that I wasn't going to get the new issue done in time, and also pondered not even going to the fair at all. Seriously. With all the stress and frustration in my life, I was not only getting worked up about doing this magazine, but also felt embarrassed about being so. Susan then came up with the brilliant suggestion to cut the issue down. I was still struggling over the content for the midsection, and deep down I knew my heart just wasn't into the content of this section. Since all of the more "personal" stuff (which bookended it) had been completed, I published the issue without its middle, and the result was seamless. (Ultimately, the research I had accumulated for this midsection had been for naught, but I do intend to use it still in a future issue.) And as usual, the new issue debuted under the wire. Despite my negative feelings the day before, 2008's Word on the Street proved to be a rewarding experience, if in spirit, and not necessarily in coins. (Financially speaking, this was my second-worst year at the show.) Serendipitously, having a smaller (and therefore cheaper) issue helped to move more copies. This industry has become more nickel-and-dime than ever, so it would seem that that for future issues (not including special one-shots like the Corman scrapbook), perhaps smaller would be better. It was encouraging getting notions to "keep it up" from some of the regular readers (one easily forgets why we do what we do), and I am also grateful for the volunteers who really showed up this year, thus making the day move fast, with some fun along the way. 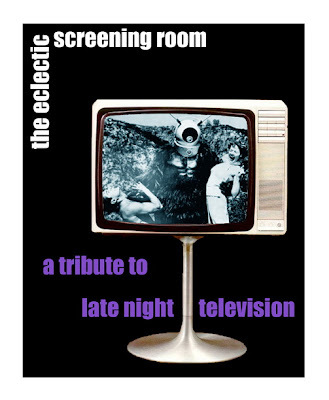 So, ladies and gentlemen, for your pleasure, here is the new ESR.. "A Tribute to Late Night Television". It would be remiss without thanking Mike and Anj for helping out on the day, Simon and David for contributing to the new issue, and of course, my deepest thanks go to Susan for her spiritual advisement. Enjoy. Way back in the eighties, I encountered a film title called Dogpound Shuffle while browsing through the TV Guide at 2 AM, was intrigued by its quirky synopsis, and switched over to Channel 11. And I was hooked. 20 years later, I had found a used VHS copy of the film (which had fleetingly been released by Key Video) and was delighted to see that it still worked its charms. (I had mentioned this re-discovery in one of my first ever blog postings.) Last year, I had the good fortune of finding a 16mm print, and had waited for a good opportunity to show it. As of this writing, Dogpound Shuffle would be the fourth film I had shown at Trash Palace (with the exception of contributing to the educational film festival in the summer), and this was the film I was most looking forward to show. It didn't matter to me if only two people showed up-- to me, this film is an object of beauty, and I just wanted it to be seen. This screening was truly done out of love-- any prospect of making money was secondary to me. This little fable, shot in Vancouver in the mid-1970's, features Ron Moody (from Oliver!) as a hobo (and former tap dancer) whose beloved dog Spot is captured by the dog catcher. 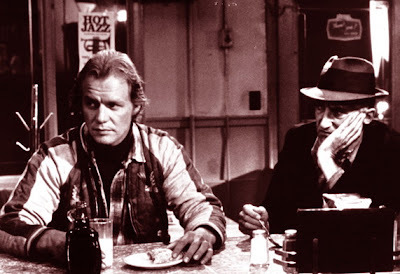 Along comes David Soul (pre-"Starsky and Hutch") as a tramp who can play a mean tune on the harmonica (that is, when he doesn't have something to eat in his hand), and so the two former a music-and-dance act to raise the thirty bucks to get the dog out of the pound! To my delight, this was one of the most satisfying screenings I've done anywhere. The audience ate the film up-- they laughed at all the right places, and were also moved at all the proper spots. And you just had to be there, to witness a bunch of forty-year-old tattooed males go "Awwww" when Spot does his little dance. What a night-- at the end, I was refreshed as though I drank from the holy mountain. I know my deepest thanks to Stacey and Dan, not just for inviting me into the Trash Palace family, but for allowing me to take a chance and show a film like this.